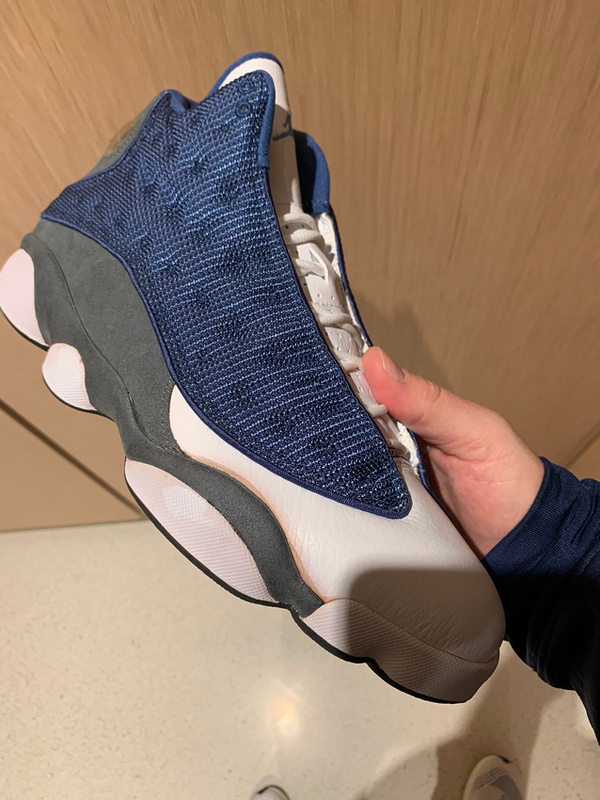 I had posted a week or so ago about the Flint's in the Jordan forum, and pulled the trigger through Stock X and they arrived. I know the 05 had the issue with the glue residue, but I didn't realize some of the pods were also susceptible to being discolored. Any good suggestions or ways to remove both the glue and the discoloration? Can I use acetone or anything else to clean them up? I have also seen the Salon 40 technique on Youtube? you can literally read the posts before yours, we just answered that question. oxiclean (sorry not trying to be an jerk or anything, but it was literally the most recent question). I would not use them on soles unless they are rubber. Dont know how they would do on clear soles. I dont use oxiclean for my soles. I usually use windex, the blue colored one. Yes oxiclean should be safe on foam and rubber., although I did explain in my post I wouldnt use it on anything other than white, however oxiclean is suppose to be safe on all colors. **** I used it on my Concords and yeezys. Came out good though, but won't use again on them. So I only use this stuff on white parts? Why do u use Windex to clean soles? Could I use those on yeezys and Concords as well as all sneaker soles? anyone know how to get glitter off air jordan 1s? people have had success wiping it off with meguiars leather wipes. it might come back tho, but likely not as much. some have reported it not comming back at all. your results may differ. LOL....i think dude meant glitter that developed/formed on the leather, not that he spilled glitter on em. youre idea would be great for a glitter spill tho. feelingood and UcanGettha20124 like this. feelingood and atdizzle like this. repped! is there an easier way before i commit myself to going out and buying barge glue? look at the posts on the previous pages.. This is a frequently asked question on the thread. Can you guys help me? I’m trying to find a way to remove these water marks from the midsole. Your Gamma pair looks almost flawless compared to mine bro.. have you tried magic eraser? (Don't use it on the patent leather though, it might ruin the gloss). Today I cleaned like 10 pair of shoes. 4 pair of Jordan 1 High's, 3 pair of Air Max 95's, 11's, Jordan 1 Low, and some others. I gave one pair a "shoe bath" with detergent and a dish bucket I got from Target earlier to get rid of some funky smell. you could try a mix of warm water and diluted laundry detergent. Or a mix of warm water and dish soap. try a gum eraser or a suede eraser or like someone else said, magic eraser.. Picked these 2011 True Blues up off GOAT the other day for real cheap. 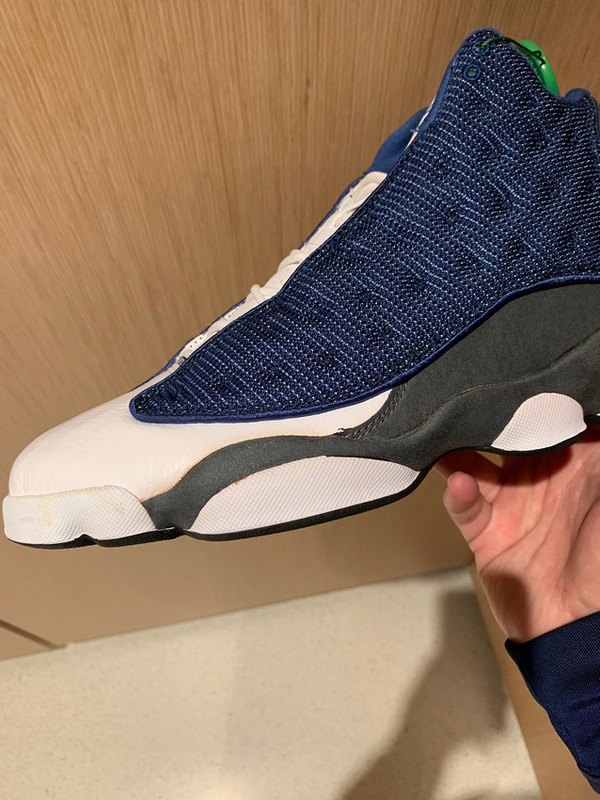 They were in rough shape, but after a cleaning and midsole re-paint.. I think they're pretty good. I know they ain't perfect, but for my 1st restoration I think it went pretty well. Here are some before and after shots. feelingood, shack314 and amiina like this. There's a tiny little chip on the midsole of my infrared 6s. I was thinking of just touching that part up. Any recommendations on what paint to use and should I just tape everything around it and dab that tiny area? Are these infrareds you just bought today? I’d take em back and try to get a new pair if possible. You could probably just touch up that spot with Angelus. Either their black or flat black paint. The factory paint looks flat in the picture, so that me be the best bet. There are some really knowledgeable guys in this thread, so just give it a little time for more responses. Ray_mcfly and luismendoza13 like this. If it were me, Id avoid painting or touch up. 1) the paint will be uneven. 2) It may induce more chipping. If I am going to paint, I will do a complete repaint. Now since the spot is so small you may be safe, but I would be worried if more of the paint will chip, since some has already started. Id leave it alone or color it in using a sharpie for now while keeping an eye on it. But my speciality is more in maintenance and not necessarily painting/restoring - even though I have quite a bit of experience with it. With painting it is important to prep the surface so that the paint will stick properly. Painting on top of paint is not an ideal way to go. But the spot is so small you could get away with it. The risk of it being if you spot paint it, and it chips - it can take more of the original paint off along with it. Ray_mcfly, shack314 and luismendoza13 like this. I’d definitely be bothered by that. But like homie above said, try a sharpie or just leave it alone, since it’s a small speck. 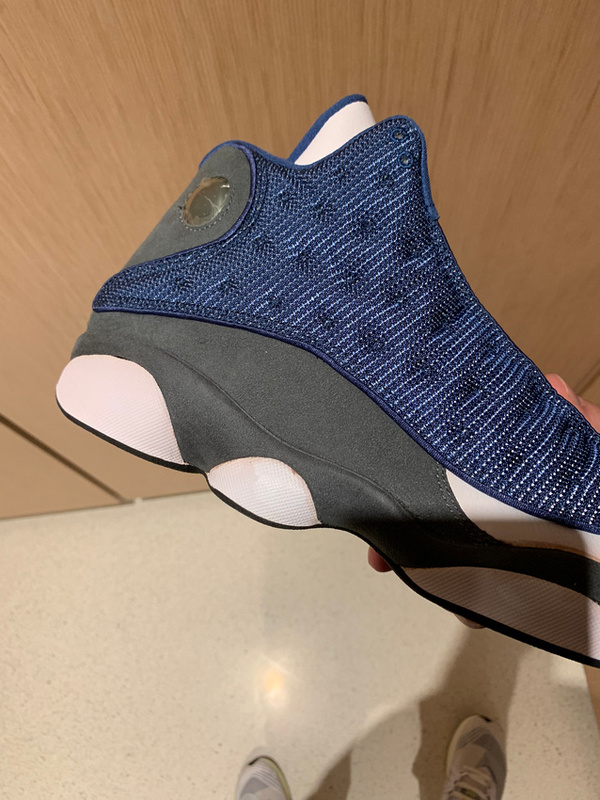 I had more serious chipping on the midsole of a pair of 4’s, that I spot treated, and it was cool for a while, but it eventually started chipping even more. So I ended up stripping it all off and repainting. I definitely wouldn’t do a full repaint for a brand new shoe though, because that just doesn’t make sense. And that spot may not even chip anymore. 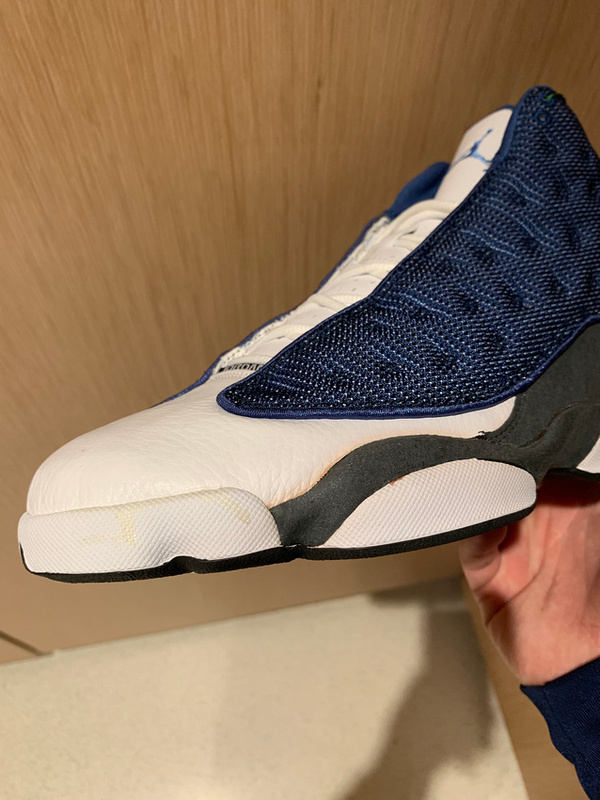 I haven’t bought J’s in a while, but I’d hope the midsoles aren’t as bad as they were 6 or 7 years ago. They’d start chipping with just light walking. Saw this midsole paint marker pop up in my Facebook newsfeed. Anybody use anything like this for white midsoles that have yellowed? In the past I’ve used one of these.